It's expensive to ship someone down here, and even more expensive to feed, clothe, and support them for a year. As a result, everyone on station through the winter is in either science, or an essential position. We don't have any janitors, dish washers, or other "luxury" personnel. 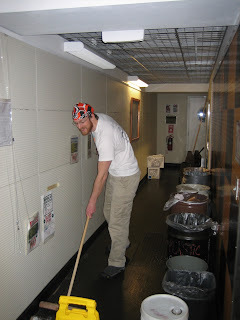 Every Monday, every person on station is assigned a cleanup task. These range from sweeping and mopping the main hallways to scrubbing down the toilets. A second bathroom cleaning is done on Thursdays, with each person responsible for cleaning a pair once every two months. The biggest task, though, is the dish pit. It also operates on a rotating roster, with each person on station assigned a 10-hour day in the pit every two months. On that day, you live in the back of the kitchen, washing the dishes of the other 59 people on station (no, we don't have a dishwashing machine), cleaning the galley (vacuuming, sweeping and mopping the floors, scrubbing the tables, etc), washing the pots and pans from the kitchen, and otherwise generally taking care of whatever labor intensive and thankless tasks come up. Dish pit's a tough day, particularly for the science folks. Everyone else gets the day off their regular work, and are allowed to sleep in until 10am before starting. We in science don't get days off, so we tend to get up extra-early to get some work done before dish pit, work during the two 15-minute breaks we get, then work late that night. Combined with 10 hours on your feet scrubbing, it makes for a long day. Dana and I decided to split ours, each taking a 5-hour shift every month, instead of a 10-hour day every other, and that makes a huge difference. The real drawback is that we don't get to spend as much time outside, enjoying the sights. Hello, Thanks for the image of the sunset. My students worked with Al B. on a project before he left and wondered what it looked like. Can I link the photo with an IPY post? who does the cooking? is it also one of the fun chores you get to do? We've got a team of chefs to take care of the cooking 6 days per week. Sundays, we have to fend for ourselves. Usually, that means leftovers, but we are allowed into the kitchen if we want. The reason it's done this way is that cooking for crowds is a highly skilled job (especially given the limited ingredients available down here), most people can't cook, and if we let them, we'd probably end up with severe cases of food poisoning fairly regularly. Where is the glamour, Keith? We had such grand plans for you, as befitting your fancy title.